I totally forgot to mention this too you, but if you didn't read it yet, it's not too late. 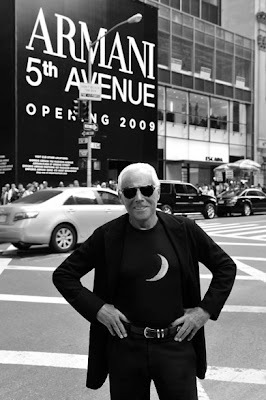 Giorgio Armani himself had a few guest posts for The Moment. Yes, as a blogger. Today I've been spending a few minutes re-reading them, just for the pleasure of it. So enlightening about just what regular days in his life are like. The posts are also super fun to go through, written in a catchy, casual style. And he sounds so natural all the time. I guess I’m a tough boss, but I also think I’m fair. The most important thing to me is a commitment to getting the job done right. What I don’t like is indifference or lack of attention. I needed a break after a marathon of interviews this morning in the restaurant on the top floor of my new store. Since I do not speak English, I use a translator to help out. I’m the king of multitasking, even during interviews. While she repeats things back in English, I use the 10 second break to tell my staff in Italian how to set the tables. I oversee every single aspect of my business and stores, and I’m very attentive to the details; even how the candles are placed on each table is essential. Totally wicked, yes? Now, as Armani would say... ciao ragazzi!